We highly suggest you consider a VIP table of 8, which allows you early entry into the event and once again includes a swag bag, a spirits sampling from Republic National Distributing and a tiki buffet. These tickets can be purchased through eventbrite.com, where you can find the event by searching for High Plains Reader. This year we have upped the value of VIP tables and added a local craft beer sampling, featuring brews from Fargo Brewing Company, Drekker, Kilstone, and Prairie Brothers. Standing-room-only tickets will be available at the door, and include a night that features eight of the best bartenders in town going head to head, in a timed contest that includes mystery ingredients every round (including a local craft beer cocktail round) and a whole lot of excitement and energy. There will also be a tiki costume contest and performances by Blue Belles Burlesque and DJ Dextrious throughout the evening. 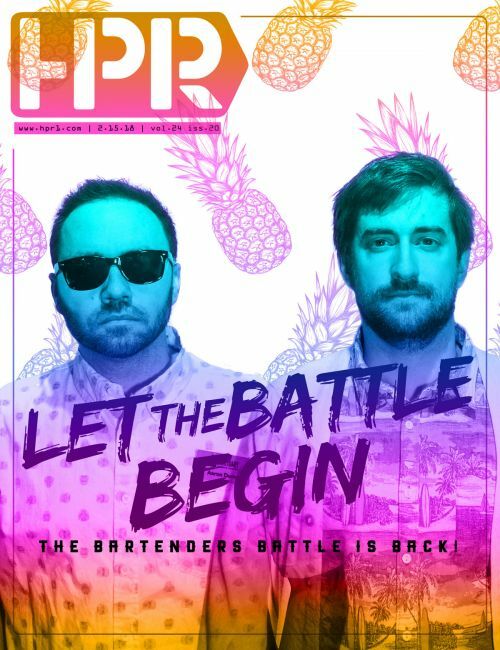 Our MCs this year will be Erik Block and last year’s Bartenders Battle Champion, Elijah Larson. Yet again this year, you will be able to see all the action up close and personal through Livewire Entertainment’s closed circuit cameras that will bring live shots to big screens on either side of the stage. This event is really all about showcasing the talent of the locals and this year’s field is as strong as ever and features return contestants, contestants from a few years back, and first-time competitors who will each bring their own unique skills and approach to creating craft cocktails. Let’s take another quick look at the fine folks who are ready to shake things up in this years Bartenders Battle. Favorite Ingredient: My favorite ingredients always change but I have been using blueberries a lot because I love them. Favorite Mixology Trend: As far as trends go I think people are looking more towards what each bartender can make, which gives all of us more options and chances to make new fun and exciting drinks. Favorite Ingredient: I try to make as many of my own ingredients from scratch as I can. Bitters, tinctures, scrubs, syrups, fat washes, rapid infusions, etc. The more you create yourself, the more unique the drink is to you. Favorite Mixology Trend: I try to see what is possible, then twist those trends into something new. Overall, a good balance of flavors is the thing I strive for the most. Favorite Ingredient: Any ingredient I have yet to work with. Favorite Mixology Trend: I think my trend is just sticking true to the integrity of the classic standards; from the history of the cocktails to understanding how they are meant to taste, to the proper execution, right down to the garnish and serving. Favorite Ingredient: I know it has become cliche, but local, local, local. I love highlighting local products at our venues. It amazes me that some people still don't know Fargo has its own distillery. It's our duty to be the ambassadors of these great local products and help get them to the masses. I am happy to oblige. Favorite Mixology Trend: I have spent the last few years serving the masses at concerts and events, so the challenge for me is to offer quality cocktails that our bartenders are able to execute in a timely manner. Unique spins on Mules, Lemonades, and Sangrias have been solid go-to’s. Favorite Mixology Trend: Variations on classics. I really like making different variations of a smash when given the opportunity. Favorite Ingredient: It depends on the day but I would say my favorites are whiskey and ginger. Favorite Mixology Trend: It is hard to pinpoint one theme or trend because the whole industry is so exciting right now. It feels like there are new ingredients and techniques popping up every day and it's hard to just stay in one lane. Favorite Ingredient: Proof recently bottled a bunch of Crooked Furrow Harvest Blend Bourbon, and we’ve all been having lots of fun playing around with that behind the bar and in the kitchen. Favorite Mixology Trend: I hear craft distilleries/breweries, buying local and chef-inspired cocktails are huge right now! Favorite Ingredient: Anything fresh. I love that the Bar and the kitchen are becoming one as far as ingredients go. Favorite Mixology Trend: I like the creativeness that bartenders from all over the world are being able to express. It’s more than just pouring a captain coke anymore. Although there is nothing wrong with a captain and coke.